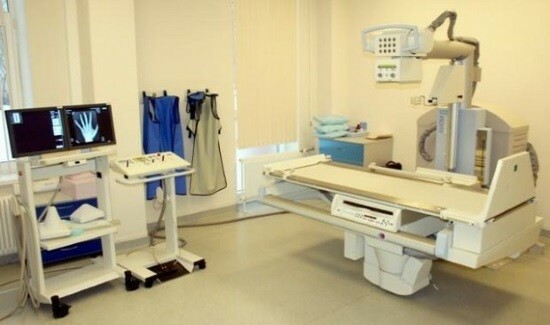 X-ray examination is the most affordable and at the same time informative in identifying pathology of the hand. It may be performed in virtually any medical institution, which has an x-ray machine. Relatively low cost and availability have made x-rays of the hand indispensable component of the diagnostic search in the case of the upper limb traumas, inflammatory and degenerative-destructive lesions. Procedure radiography of the brush does not require any specific training. It is desirable to remove from the upper extremity jewelry (bracelets, watches, rings), they negatively affect the quality of the picture. For protection from ionizing radiation to the patient wear lead apron, small children leave open only the investigated anatomical region. The scanning procedure is carried out in the patient sitting when the arm is bent at the elbow, and a brush located on the table x-ray apparatus. The correctness of the styling brush while performing x-ray depends on the information content of the survey, which further significantly affects the choice of treatment. A direct projection. It can be designed in two variants – the back and Palmar. The palm is located horizontally on the tape, x-rays will pass through the middle of the hand perpendicular to the cassette. Define the carpal bones (triquetral, lunate, scaphoid, hook, capitate, trapezoid), with the exception of the pisiform, the visualization of which requires special installation. Also visible are the wrist joint, metacarpal, carpometacarpal joints, intercarpal joints, phalanges. The lateral projection. Brush ulnar edge located on the cassette, thumb forward slightly reserved. It is well defined the contours of the carpal bones, metacarpal bones, phalanges. Basically a map projection is used in medicine to detect displacement of the metacarpal bones. Oblique rear projection. The brush is placed so that its rear surface forms a 45 degree angle with the cassette. The images are clearly visible, triangular, pisiform, hook bone, the first and fifth Metacarpals. The Palmar oblique projection. With this laying the Palmar surface of the hand forms with the cassette 45 degree angle. Visualize the scaphoid, trapezoid bone, trapezoid bone. There are also additional styling to visualize the individual bones, for example, the pisiform or scaphoid. X-rays of the first finger. Pictures are made in direct and lateral projections. For direct projection, the thumb is placed on the tape back surface. In side view it include radial edge. Such pilings are able to image phalanges, first metacarpal, interphalangeal, metacarpophalangeal joints. Radiography of second to fifth fingers. Here also use direct and lateral projection. Need a finger placed Palmar side (direct view) or the side (side projection) on the tape. The images are visible phalanx, the joint space of the interphalangeal joint. What changes are visible on radiographs of the brush? Depending on the presumptive diagnosis (trauma, inflammatory process) the doctor prescribes the study of a particular area of the brush. Accordingly, the identified pathological changes on x-ray picture. The x-ray hand clearly detects changes in bone structure: fractures, fissures, the presence of bone fragments, their displacement. Based on these data, the surgeon plans to further treatment, if necessary, the issue of surgical intervention. Conducting x-rays in trauma of a brush with a suspected broken bones included in the standard medical examination and is mandatory for all categories of patients. Such changes can be observed as in systemic connective tissue diseases (scleroderma, rheumatoid arthritis) and with isolated lesions of the wrist joints by the inflammatory process. 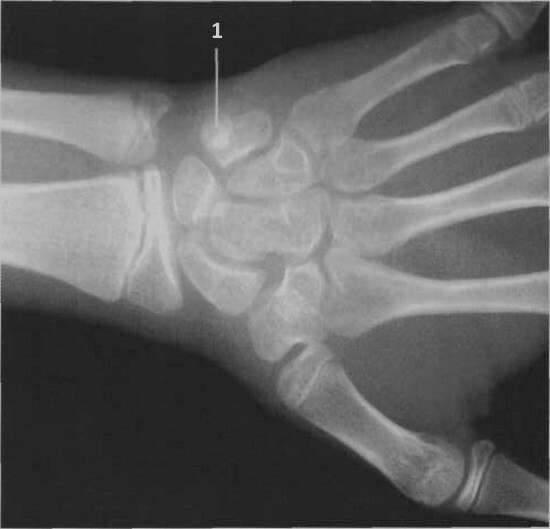 For this disease the characteristic changes in the tissues surrounding the small joints of the hand, there is a seal, modifying the thickness and contours, there are multiple, rarely single calcification. About the presence of intraarticular effusion are judged by indirect radiological signs, such as increase of the joint space. In the affected joints is sometimes observed osteoporosis of adjacent bone surfaces, which is expressed in decrease in the density and number of trabeculae, thinning zamechatelnyh records. There may be signs of lesions of the periarticular tendons in the form of calcification. Typical for arthritis of the hand symptoms are cystic changes that can be identified already in the early stages of rheumatoid disease. As a rule, they are small, multiple, round-shaped. The running stage is characterized by formation of bone erosions. An alternative to the classical x-ray may be a computer tomography. It is assigned to clarify the nature of the damage or the pathological focus. CT is prescribed in the case of the upcoming surgery, modern computer hardware allows you to create three-dimensional images of anatomical structures. The disadvantages include greater radial load on the body, compared with routine radiography. For visualization of soft tissues is often carried out by ultrasound. It is safe and can be used in the examination of children and pregnant women with diseases of the hand. The most modern diagnostic methods is MRI, which provides a maximum of information about both bone and soft tissue structures of the musculoskeletal system. The disadvantage is the high cost of research and limited availability of MRI machines is only in large medical institutions. Analog radiography with getting the picture on tape is held in almost all state and private medical institutions. More complicated is the situation with digital x-ray machines, they have a relatively small percentage of hospitals. For holding x-ray is enough direction from the attending physician indicating the areas of research and diagnosis. Radiation exposure during radiography of the brush is less than 0.1 mSv. X-rays of the hands is not prescribed for pregnant women and children up to 15 years. The exception is a situation with severe injuries brush when only x-ray helps to visualize the pathology and to plan treatment. In such cases, use remedies for the patient or recommend a more secure technique (MRI).